RENNER submersible centrifugal pumps are designed for vertical deployment in non-pressurized tanks, open basins or pits. They offer the same range of services as magnetic drive centrifugal pumps, and enable additional possibilities due to the vertically submerged installation in the container or tank. 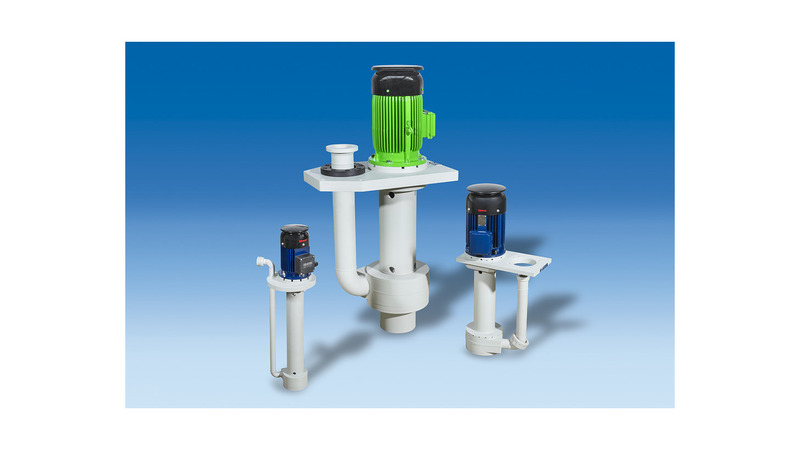 These pumps without sealings and safe-to-run-dry, out of fully plastic material, are expecially space-saving and are installed mainly in industrial facilities. The pumps are equipped with special seals, which prevent, also with heavily creeping solutions, the escape of steam and so the hereby created undesired crystallization. As standard the pumps are equipped for immersion depths from 200 mm to 500 mm; in addition, by installing an intermediate bearing, immersion depths up to 2.500 mm are possible. The equipment with customer-specific installation flanges is possible, if desired.